This species is accepted, and its native range is Nepal to S. China and Indo-China. Perennial; caespitose. Culms erect; robust; 400-600 cm long. Culm-internodes solid. Ligule an eciliate membrane. Leaf-blade base tapering to the midrib. Leaf-blades 75-150 cm long; 20-60 mm wide. Leaf-blade midrib conspicuous. Leaf-blade margins scabrous. Leaf-blade apex acuminate. Inflorescence a panicle with branches tipped by a raceme. Peduncle glabrous. Panicle open; ovate; 30-80 cm long; 15 cm wide. Primary panicle branches whorled at most nodes. Panicle axis glabrous. Panicle branches glabrous. Rhachis fragile at the nodes; subterete; villous on surface. Rhachis internodes filiform; 6-7 mm long. Spikelets in pairs. Fertile spikelets sessile and pedicelled; 2 in the cluster; subequal. Pedicels filiform; 2.5-3.5 mm long; villous. Spikelets comprising 1 basal sterile florets; 1 fertile florets; without rhachilla extension. Spikelets lanceolate; dorsally compressed; 3-4 mm long; falling entire; deciduous from the base, or with accessory branch structures. Spikelet callus bearded; base truncate. Spikelet callus hairs white; 1.5 length of spikelet. Glumes similar; firmer than fertile lemma. Lower glume lanceolate; 1 length of spikelet; membranous; much thinner above; 2-keeled. Lower glume primary vein scabrous. Lower glume surface flat; villous. Lower glume margins ciliate. Lower glume apex acuminate. Upper glume lanceolate; 1 length of spikelet; membranous; much thinner above; without keels; 3 -veined. Upper glume margins ciliate. Upper glume apex acute. Basal sterile florets barren; without significant palea. Lemma of lower sterile floret linear; 3-4 mm long; hyaline; 1 -veined; without lateral veins; ciliolate on margins; acute. Fertile lemma linear; 3-4 mm long; hyaline; 1 -veined. Palea absent or minute. Lodicules 2; cuneate; ciliate. Anthers 3. Asia-temperate: China. Asia-tropical: India and Indo-China. Ahmed, Z.U. (ed.) (2008). Encyclopedia of Flora and Fauna of Bangladesh 12: 1-505. Asiatic Society of Bangladesh. Wu, Z. & Raven, P.H. (eds.) (2006). 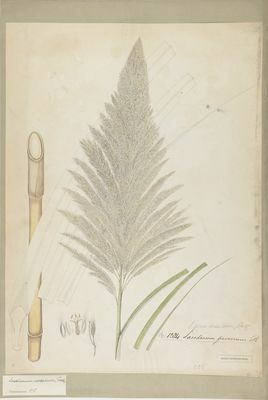 Poaceae Flora of China 22: 1-733. Missouri Botanical Garden Press, St. Louis. Press, J.R. et al. (2000). Annotated Checklist of the Flowering Plants of Nepal: i-x, 1-430. Natural History Museum, London. Sumadijaya, A. (2011). 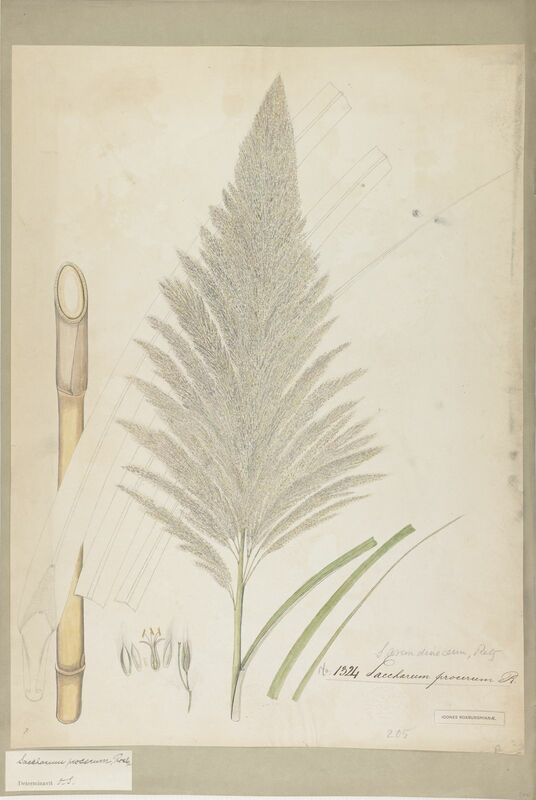 An account of the non-bambusoid alien grasses (Poaceae) in java, one century after first records by Backer Folia Malaysiana 12: 47-68.